It was another cold day for our Level 3 and 4 Trial at Bournheath today but we hadn’t been troubled by snow unlike many other parts of the country and everyone managed to attend braving icy roads along the way. Karen Kendall and Sue Benson, my trusty judges, arrived promptly and cracked on quickly after their briefing with the searches. They set a fair but challenging Trial for both levels and those who did well we’re justifiably proud of their performances. Congratulations to Kathy Killick & Rowan for taking 1st place and an Excellent title in Level 3 and Sarah Taylor & Hugo for winning Level 4. 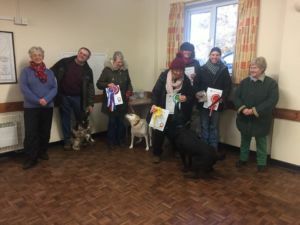 Well done to the other rosette winners who were close on their heels. I’d like to thank all the competitors for putting up with the freezing conditions without complaint while they waited patiently for their turns. I hope the teas, coffees, cake and biscuits went a little way to easing the discomfort! I’d also like to thank my fabulous team of helpers: Michelle Rodgers and Fiona Vaughan who were scribing, Liz Burton our runner who made sure everyone was where they should be and Jude Tayler and Anne Johnson for tea making and kitchen duties. It would not be possible to run a Trial without a great team behind me. Many thanks to Karen and Sue for being great judges and offering the competitors comprehensive feedback after every search which was much appreciated by all. I’ll let them comment on individual performances and well done to those who didn’t qualify but gave it their best shot. It was dry and sunny day with a sharp bitter wind as Susan Benson and I drove up the motorway to Bournheath. We were greeted with a lovely warm welcome and a hot cuppa from Karen and team before getting the Level 3 searches ready for the 10am start. I started with the exterior search of 14 items, the cloves hide near the start, and the gun oil at the far end. The area was totally fenced and cosy with a composite flooring of rubber pieces. I thought this should be fairly straightforward but had underestimated the sniff appeal for the dogs. Many handlers chose to work their dogs on-lead which worked OK for some, but some dogs were distracted by tightened lines after trying to change direction, with handlers too close to observe changes in behaviours. 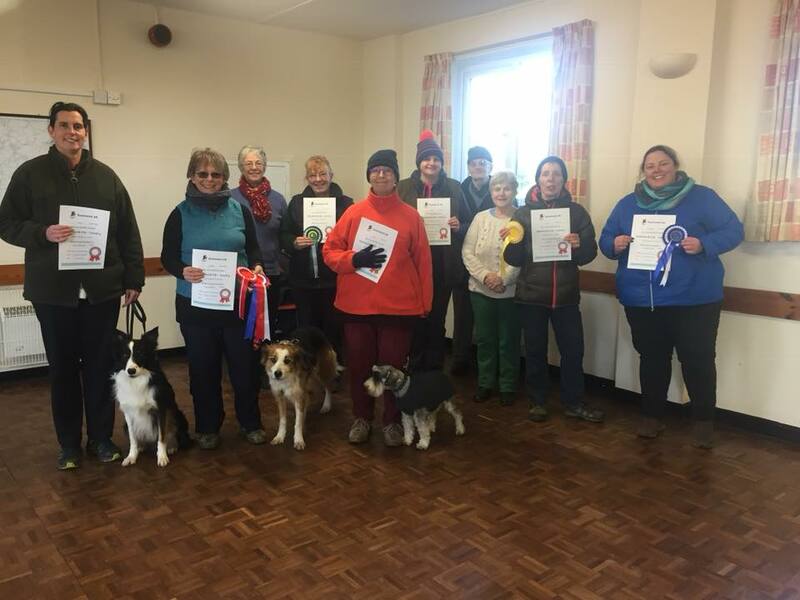 However, some lovely off lead work by Liz and Cash and Kathy and Rowan with quick times. Julie and Daisy, and Jane with Jaffa also found both hides really nicely. Some dogs seemed to find the cloves hide very easily but struggled to find the gun oil. Then hooray we were back in the warm for tables and chairs and the perimeter search. This went a lot better with all but one team finding both hides. Alison with Dylan and Kathy and Rowan had the joint fastest time, a mere 39 seconds to get both scents. Well done! Lovely work too from Pat and Jack, Lorraine and Chester, Helen and Preston and Jane and Alfie. Nerves of steel from Collette with little Lola as she waited for the last alert! Well done to all who entered Level 3. Excellent work from all, though a little more practice with moving the dog onto the second scent for some. Congratulations to all who qualified and a massive well done to our first place and Level 3 Excellence title winner Kathy and Rowan. After a delicious lunch we started the Level 4 trial with the tables and chairs and perimeter search. The two decoy scents were on the chairs and tables and the cloves and gun oil were on the perimeter. The gun oil was on an item placed near the start which proved a challenge for some, and some handlers talked their dogs into alerting on the decoy scent as they were convinced a hide was on a chair! Peter and Dolly found both hides in the quickest time of 55 seconds. Great work too from Sarah with Hugo and Julie and Poppy. Then it was back outside into the cold for the exterior search. I put cloves into some metal weave pole holders which were against a wall and the gun oil was taped over a hole in a plastic container. The two decoy scents were in another plastic container and another of the weave pole holders. Denise and Butty did some great work to get both scents in the quick time of 62 seconds just beating Alison and Izzie who did a cracking search in 96 seconds. Lisa managed big boy Tomba around the area to get both scents. Jackie and Lima, Julie and Poppy also did great searches. Well done to all who qualified Level 4 as the windy afternoon conditions made things quite tricky. Congratulations to our winning team Sarah and Hugo. What a wonderfully enthusiastic dog, brilliantly handled by Sarah who reads him so well. Congratulations too Denise and Butty on a fabulous second place and Level 4 Excellence Title. Thank you to Karen Denton for asking me to judge your trial and to my scribe Michelle and the wonderful helpers who kept the competitors flowing, and me supplied with hot drinks and yummy cake! I thoroughly enjoyed watching the different breeds work and I thank the handlers for kindly accepting my decisions. I wish you all further success in your training and future trials. Karen Kendal and I shared the judging, which worked really well. I started off with boxes and luggage. There were some very good searches but a maroon bag that held the scent caught a lot of teams out. The next search I judged was vehicles. It was blowing a gale and it was very interesting to see how the teams dealt with it. It was clear to see who could read the wind or not. Again some very good searches kathy Killick and Rowan and Alison Williamson with Dylan worked extremely well. I shall be watching to see these teams as they progress. Well done. Again we shared the judging. I started off with the vehicles. Again the weather caused some mistakes. 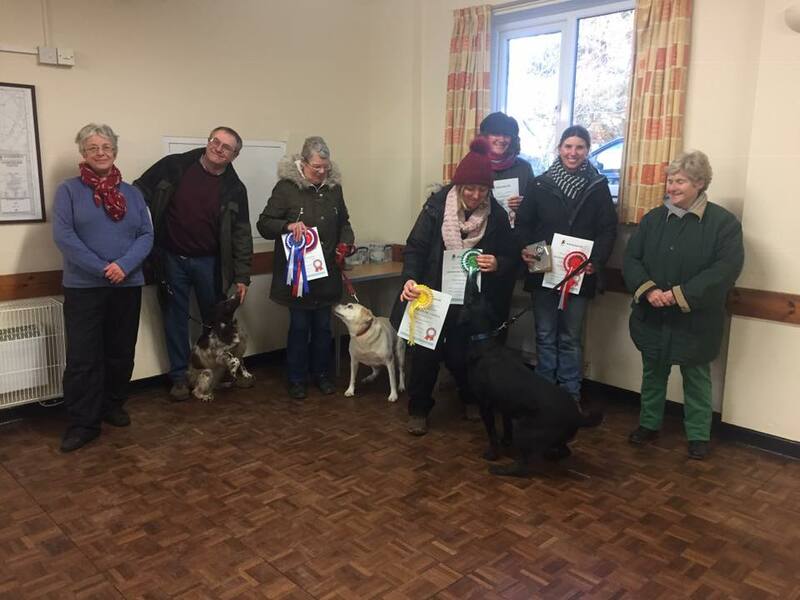 Lisa Finney with Tomba and sarah Taylor with Hugo did very well and read their dogs brilliantly. Must mention Julie Russon with little Poppy. Such a lovely team and little Polly knew her stuff and was so determined. Then back to boxes and luggage. Sarah Taylor with Hugo and Alison with Izzie were so lovely to watch. Overall all the teams in level 4 worked very hard and have great potential. I look forward to seeing them moving up the levels. Well done. Thankyou to my partner in judging, Karen Kendal, Karen Denton for asking me to judge. It was a very well run trial and I had a thoroughly enjoyable day. Also thankyou to the scribes, runners, and the ladies who kept us topped up with hot drinks, biscuits and cakes. Everyone did their part so well, brilliant. Download Entry Form to book a place. Now fully booked.